Comprehensive information about János Arany including biographical information, facts, literary works, and more. 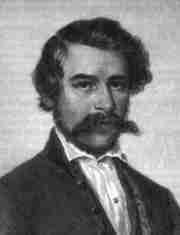 János Arany, the greatest poet of Hungary after Petöfi, was born at Nagy-Szalontá on the 2nd of March 1817, the son of György Arany and Sara Mégyeri. This educational János Arany resource has information about the author's life, works, quotations, articles and essays, and more. Articles about János Arany or articles that mention János Arany. Here are a few random quotes by János Arany.